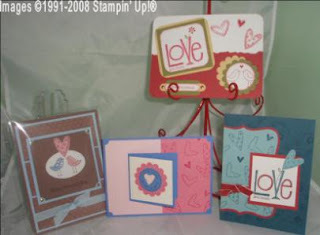 Lily's Ink Pad: Love this Stamp Set and Punch! On December 23, Stampin' Up! started a promotion called the Love You Much Bundle. It is so SUPERCOOL. I have had to hide my excitement due Christmas, etc, but WOWZER! This is a cool bundle. These are swaps I participated in. With the upcoming holidays (when I first got my bundle on preorder), I knew I wouldn't have time to make a gazillion examples. I decided I needed to rely on the expertise and creativity of others. Did I get lucky or what! These are the best swaps. I am so inspired that I cleaned up my stamp room the past two days so I can play! Here are the details of the promotion. You can also click here or on the side bar to see the flyer for yourself. The Bundle includes A BRAND NEW PUNCH! See it in the back? This is an amazing punch and it coordinates with the stamp set! 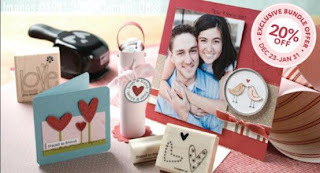 Get ready for Valentine's Day with the exclusive Love You Much Bundle (item 115405). 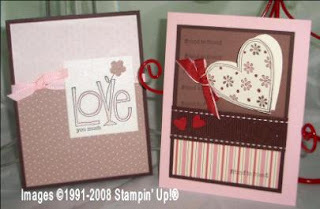 The Love You Much Bundle includes the following: Love You Much stamp set, Candy Lane Designer Series paper (Close to Cocoa, Pink Pirouette, Riding Hood Red, Very Vanilla), Heart To Heart punch, all for $41.48. This is 20% off the retail value of $51.85! This is a set of cards that show how versatile the set is... you don't have to use just the Candy Lane Designer Series Paper that comes with it! I love these colors for Valentine's Day! 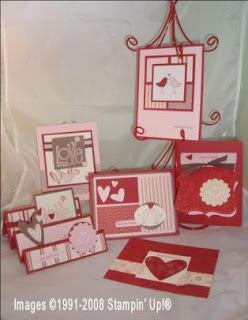 By the way, I am offering two classes for anyone who buys the bundle from me: 1) a 25 card Make-Your-Valentine's class and 2) Make a Gift Set class. Each Class is free with your purchased of the bundle. We will be using materials from your bundle with a few add-ons! Classes will be in late January and early February (dates to be determined). Register and prepayment is key. I can ship your bundle to you directly or you can order by January 15th and I will place the order for arrival here in time for the classes. Wow You have been stamping away! I played with this set today too!